Now you can have a Big Desk Mousepad so not just a tiny pad that is just a couple times bigger than your mouse but one that is as big to hold even your computer. This mousepad comes in a bunch of colors like black, bronze, dark brown, pink and silver. You can pick between two sizes 31.5 x 15.7 inches and 35.4 x 17 inches and it comes in a roll to easy to ship and install. 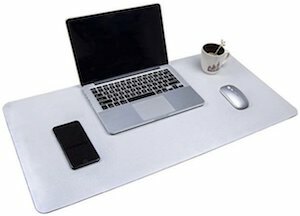 So now your desk can look great because of this giant mousepad that will protect your desk and makes it a surface that you can mouse where ever you want. Get rid of that tiny mousepad and replace it with this Big Desk Mousepad.